Kumbhakarna is one of the playable Gods in SMITE. Do you hear it? That distant rumble like thunder across the mountains? Like pitched battle from miles away? Like a stampede of elephants across the plains? Know it is none of these things. That rumble you hear is the bellowing snore of Kumbhakarna, the Sleeping Giant. Quick with a laugh, honest with friends, but devastating in battle, Kumbhakarna embodies the traits of a hero, but loyalty to his tyrant brother, Ravana, often leads him to the wrong side. So jovial and pious is he, that when granted a boon by Brahma, Kumbhakarna wished to take Indra's place and rule the Heavens. Indra was jealously threatened, convinced Brahma would let the good-natured giant usurp him, and magically twisted Kumbhakarna's tongue at the last second. Instead of asking for “Indraasana” (Indra's Seat), he asked for “Nidraasana,” ... to sleep. Now, Kumbhakarna is a dozing behemoth, waking only once every six months. Yet, Ravana is concerned with the growing fervor of the battle between gods and demons, sensing his dominion slipping. Prematurely, he has awoken his brother and pressed him to fight. Though reluctant, as if he knows his brother's stance is unjust, Kumbhakarna fights out of loyalty and a warrior's code. Now, that rumbling you hear, it is not his snores, but Kumbhakarna's mighty roar. Or was that a yawn? It will also prevent death from execute effects. The flying minion has a range of 90. The dash and flying minion both have a width of around 6. Has a width of around 8. Kumbhakarna is knockback immune while channeling. The dash itself has a width of around 6 while the landing/knockup has a radius of 20. Whenever you damage an enemy god with an ability you steal 8% maximum mana as well as 5% maximum health from the target. The Stats remain stolen for 45s and targets affected can have multiple Buffs and Debuffs at once. This can only occur once every 15 seconds. You gain an additional 15% Damage Mitigation for 3s whenever you are hit with a hard Crowd Control Effect. This can only occur once every 15 seconds. Using this item applies a shield to themselves and allies within 35 units for 100 Health + 12 Health per God Level for 3s. As Kumba kill an enemy God by bouncing a minion into them using Throwback. As Kumba root three or more enemy Gods with one Groggy Strike. Kumbhakarna and Ravana are brothers. Kumbhakarna's victory screen makes references to Tunak Tunak Tun's music video. 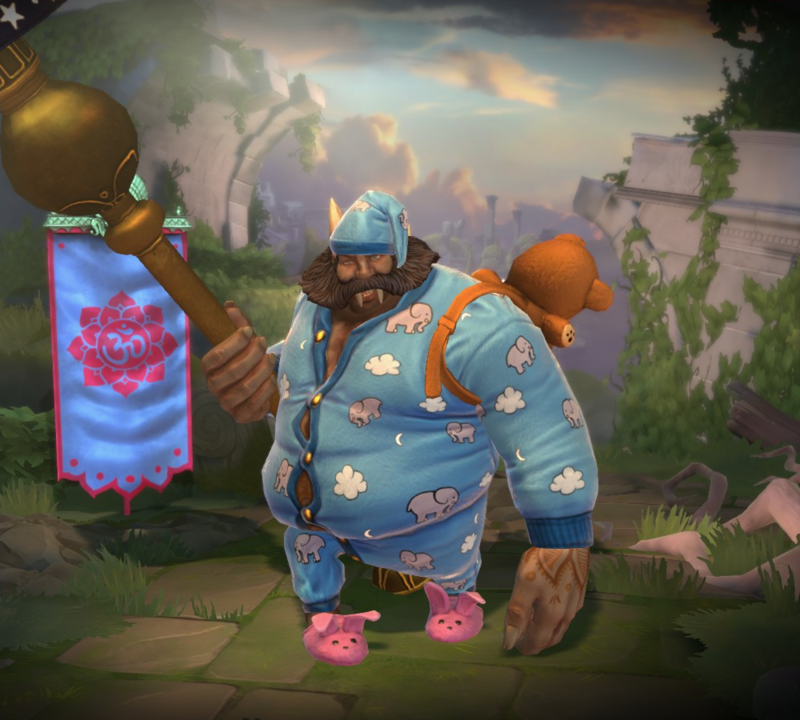 The name of this skin is a reference to the short story Rip Van Winkle. Arachne, Fenrir and Thanatos appear in the card art of this skin. This skin shares its theme with Snuggly Artemis. This skin's Berserk form is based on the Yeti. 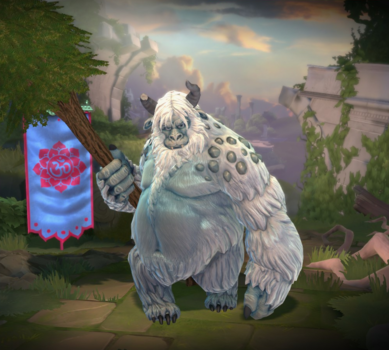 This skin share its theme with Winter's Curse Cu Chulainn. This skin is based on the movie Mad Max. 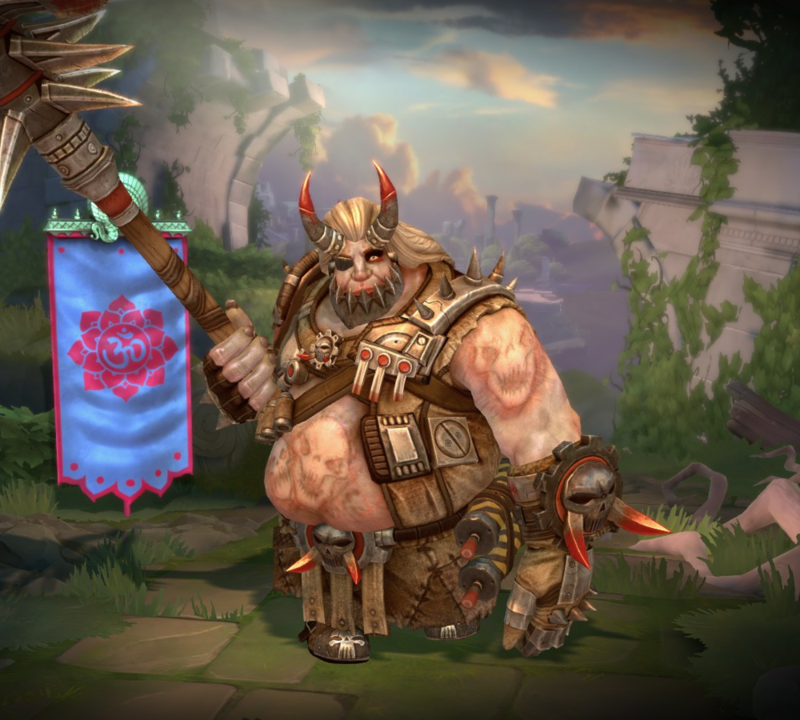 This skin share its theme with Wasteland Cu Chulainn and Badlands Vulcan. This skin was loosely based on the comic and movie Black Panther. Fixed Warlord Kumbhakarna's Special Emote not continuing to loop. Lowered the volume on Throw Back for General Nosseris. Decreased cooldown from 15s to 13s. Increased Base Damage from 70/120/170/220/270 to 90/140/190/240/290. Adjusted Cooldown from 90/85/80/75/70s to 75s at all ranks. Increased and adjusted audio for this ability, allowing it to be more easily heard over other abilities. Decreased Mana Cost from 70/75/80/85/90 → 50/55/60/65/70. Increased Cooldown from 60s → 90/85/80/75/70. Increased base damage 50/90/130/170/210 → 70/120/170/220/270. Increased Root duration from 1.5s → 2s. Increased landing damage from 225/300/375/450/525 → 250/350/450/550/650. Fixed not being targetable by Khepri Ultimate if asleep. Fixed getting stuck on top of Arena walls after being executed from Ao Kuang. Fixed Kumbhakarna Standard skin showing bad textures to other players. Adjusted time to complete charge from 0.7s to 0.4s, effectively making him charge faster. Radius increased from 20 to 25. Tooltip incorrectly stating a radius of 25 is now correct. Fixed getting stuck on collision after being executed by Ao Kuang. Remaining hits indicator now properly updates if he reaches a level that increases the number of hits to down him while he’s napping. Fixed a bug where the passive was not providing an extra required hit at level 20. Fixed a bug where Kumbhakarna could be healed while sleeping. Fixed a bug where the radius was too large while he was downed. Fixed a bug which would cause Sleepy not to activate. Increased cooldown from 15 to 18s. Radius reduced from 25 to 20. Mesmerize duration reduced from 1.5/2/2.5/3/3.5 to 1/1.5/2/2.5/3. Will now deal damage to wards. Fixed an issue with Kumbhakarna not dashing when firing next to an enemy Hades during Pillar of Agony. Fixed an issue that prevented players from renting Kumbhakarna. Fixed a bug where players could be thrown underneath the level when hit after being thrown by Sobek’s Charge Prey. Fixed an issue which was causing Kumbhakarna to lose his aura item effects after waking up from Sleepy. Fixed an interaction issue between Kumbhakarna's passive and Geb's Stone Shield. Added missing difficulty tag to Kumbhakarna's tooltip. Corrected an issue where Recall and Protected Recall did not break when Kumbhakarna fell asleep. You can no longer recall or teleport while sleeping. Corrected a bug where Brute (large) minions were not thrown back when hit. Corrected a potential issue where a thrown back minion could hit an enemy more than once. Fixed issue with cooldown not triggering at the correct time, and causing issues with interruption. Kumbhakarna has been added to the game. This page was last edited on 10 April 2019, at 21:54.